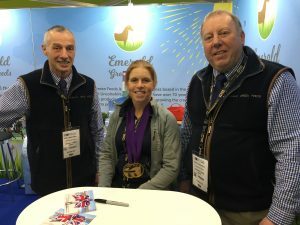 The Emerald Green Feeds Team had a busy time at the Beta International Show this month, it was great to catch up with lots of our stockists and hear how well our feeds are selling through their stores. We love hearing the stories that our stockists tell us about their customers and our preducts, it means a lot to us to receive feedback which is why we love going to shows and events around the country. This year at BETA International we had our lovely Brand Ambassador, Ros Canter come to the stand to meet with customers and sign some postcards. She had a great time telling customers how much all the horses in her yard enjoy their Emerald Green Feeds Grass Pellets and Alfalfa-mazing.